Are you looking for the ultimate answer for all your Jewish calendar needs? 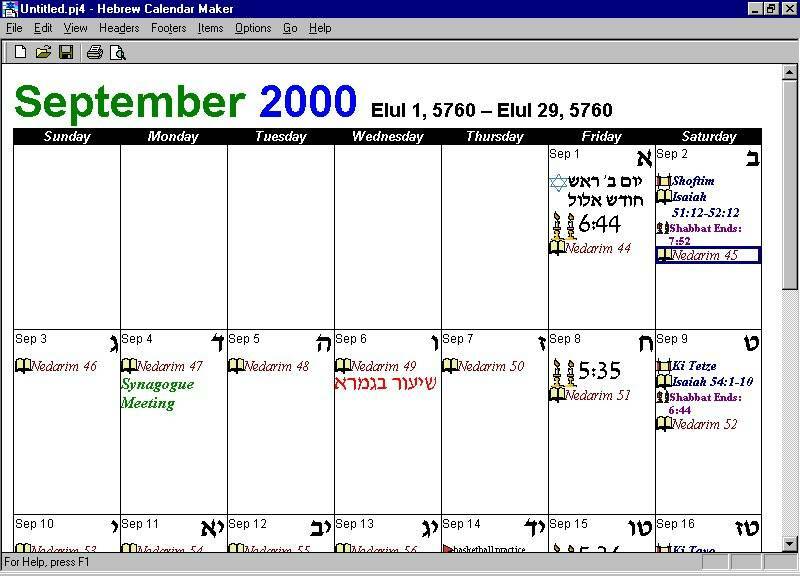 Look no further than It's About Time, an easy to use, powerful, and practical program that prints great-looking Jewish calendars complete with graphics and Hebrew dates, calculates Halachic times (Z'manim), and displays holidays and user-defined appointments. It's About Time enjoys the acclaim of users worldwide, and it has received the coveted five-star rating from the Jerusalem Post. In short, It's About Time is indispensable for synagogues, JCC's, Jewish organizations, and anyone who wants to stay organized, and attuned to the Jewish calendar. Edit headings with one click! Holidays, Zmanim, and days-of-week header can be shown in Hebrew. Enter your own information in Hebrew or English! 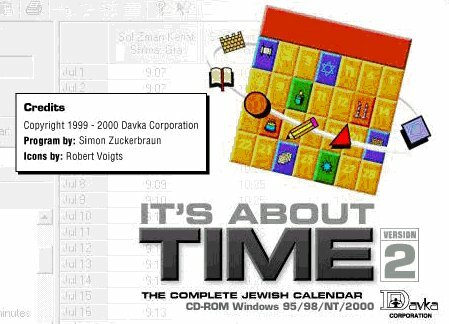 It's About Time 2.1 is a suite of three programs -- the Hebrew Desk Calendar, Hebrew Calendar Maker, and Halachic Time Explorer --which interact to provide an integrated, seamless computing experience. The Hebrew Desk Calendar is useful for adding appointments and meeting information. It displays one month at a time on-screen -- great for easy reference! With one click of a button you can see all of the upcoming Jewish holidays for the year! The Hebrew Calendar Maker prints beautiful, full-color calendars complete with graphics and relevant information, including Torah and Haftarah readings, personalized information in Hebrew or English, Zmanim, information from the Hebrew Desk Calendar, Yahrzeits, and much more. It can even print a customized footer at the bottom of the calendar with the name of your organization or synagogue! Finally, the Halachic Time Explorer calculates, displays, and prints full-page charts with Halachic times for any location. It includes a built-in list of cities, and the location list is fully customizable. The Halachic Time Explorer features a wide variety of Halachic time options that can be displayed and printed with Hebrew or English titles. There are many products that have been developed for the Jewish Calendar, but none match It's About Time in versatility, ease of use, and flexibility.